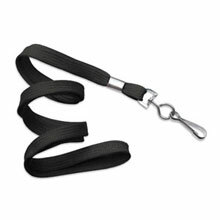 Brady Lanyard - Black Flat Braid Woven Lanyard with Nickel-Plated Steel Swivel Hook, 3/8" Width, Length 36". Quantity of 100. The Brady 2135-3501 is also known as Brady People ID	2135-3501	or 21353501	.